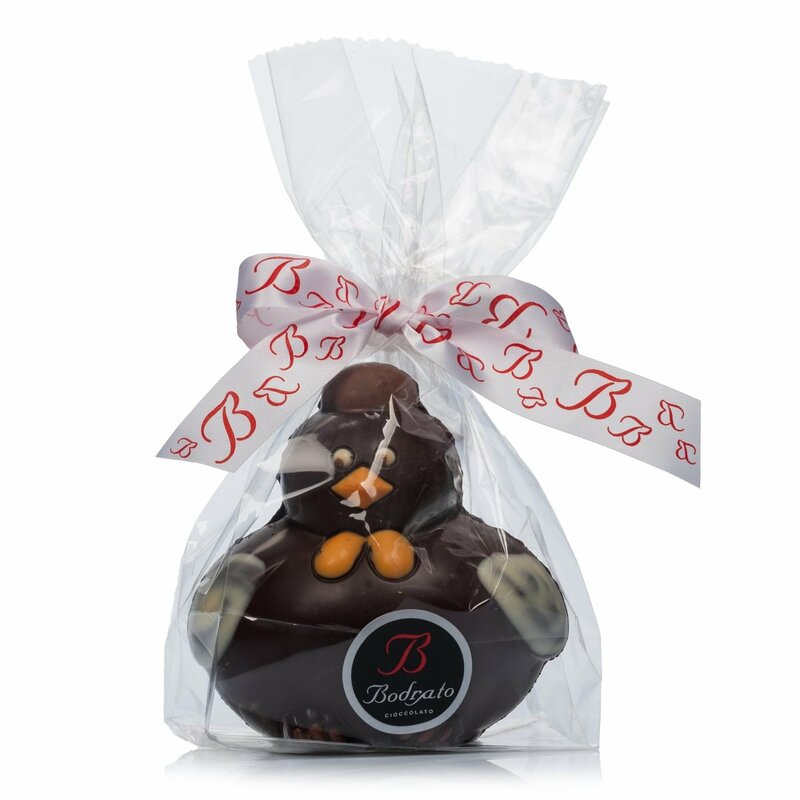 The dark chocolate Gallinella Paffuta from Bodrato is a delightfully chubby chocolate chicken, and makes a very amusing Easter gift. The high-quality dark chocolate produced by Bodrato is made in the traditional artisan way. 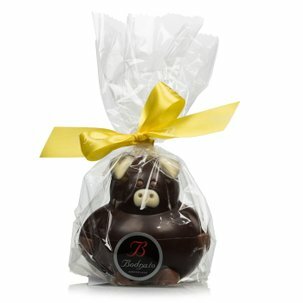 The chocolate is processed entirely by hand, using only specially selected ingredients. The chubby chocolate chicken is very charming and original, and makes a great Easter gift for either adults or children. Ingredients Dark chocolate (min. 60% cocoa solids), cocoa paste, sugar, cocoa butter, emulsifier: soy lecithin, natural vanilla flavouring. Decoration: White chocolate (min. 29.5% cocoa solids), sugar, cocoa butter, whole milk powder, emulsifier: soy lecithin, natural vanilla flavouring, food colourings: E120 (red), E100 (yellow). Milk chocolate (min. 32% cocoa solids), sugar, cocoa butter, whole milk powder, cocoa paste, emulsifier: soy lecithin, natural vanilla flavouring. For more information on product labels, please contact our Customer Service department. The information on the labels of the products may vary for reasons beyond our control, therefore, there may be discrepancies between the information on the site and that on the products delivered. Please always check the information on the product before consumption or use. The traditional artisan confectioner Bodrato was founded in the 1940s in Genoa, but moved first to Capriata d'Orba and then to Novi Ligure in 2014. During this time, attention to detail combined with the love of chocolate and respect for tradition resulted in high quality products created in accordance with ancient recipes, but using the innovations offered by modern technology. This led to a complete range of chocolate-based products capable of enchanting the hearts and tastebuds of even the most demanding customers.